Slava is a member of the tax planning group at Sweibel Novek. Her practice focuses on personal and estate tax planning, corporate reorganizations, the taxation aspects of the owner-managed business, and cross-border and non-resident issues. Slava works with the clients of the firm to develop their succession plans, to restructure and to craft the sale of their businesses and other important assets, such as real estate. She is recognized for her impressive research and analytical skills. Slava also represents clients in their interactions with the taxation authorities in the context of audits, reassessments, and voluntary disclosures. Slava has completed CPA Canada’s In-Depth Tax Course. 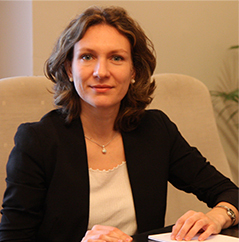 Slava obtained her Bachelor of Civil Law and Bachelor of Common Law from the Faculty of Law of McGill University where she graduated with great distinction. She also has a law degree from the University of Sofia in Bulgaria. Slava was called to the Quebec Bar in 2007. She was named to the Bar School Excellence Roll for placing first on the bar exam in her term. Prior to joining Sweibel Novek in 2011, she practiced with the tax group of a national law firm.